Scivation’s Xtend and BSN’s Amino X rank among the most popular intraworkout/BCAA supplements on the market. With very similar ingredients profiles, potential buyers are often clutching at straws when it comes to picking between the two. This review will look at how each of the supplements compare on a number of different levels and provide a rationale for which supplement we consider the best. The table below gives a snapshot overview of how Xtend and Amino X differ with regard to their ingredient profile. As far as amino acids go, the major difference in amino acids between the two supplements is that Xtend provides glutamine, while Amino X provides alanine and taurine. On a micronutrient level, Amino X comes with vitamin D, while Xtend includes vitamin B6 and the electrolytes potassium chloride and sodium chloride. Glutamine and taurine are relatively common ingredients in intra workouts or BCAA supplements. However, alanine stands out a little as it is a lot less common in intra workouts. Alanine is classified as a gluconeogenic amino acid, meaning that it can serve as a precursor to glucose in the body, even though it is not a carbohydrate itself. However, the key reason alanine is included in the formula is mostly likely due to that some studies have shown it may help reduce the breakdown of branched-chain amino acids (BCAAs). So it would appear that BSN added alanine to the formula to complement the action of the BCAAs in the Amino X. Unfortunately, there is not much science or research supporting the ergogenic property of BCAA’s combined with alanine when used in athletes. Vitamin D is the other standout ingredient that’s only found in Amino X. One could argue that vitamin D has been the vitamin of the ‘naughties’ with the wealth of research that has emerged on it. Traditionally, healthy vitamin D levels have been associated with improved cardiovascular outcomes, enhanced immune function and a reduced incidence of cancer. But until recently there weren’t any suggestions that healthy vitamin D levels may be associated with greater muscle strength and performance. To their credit, BSN obviously make it a priority to keep abreast with the latest research and have stepped out on a limb by throwing vitamin D into Amino X. In just the last couple of years, research has been published showing that pre-exercise vitamin D concentrations can influence the recovery of skeletal muscle strength after just a single bout of intense exercise. Amino X also includes a 2g Efforsorb EnDura Composite proprietary blend, which consists of citric acid, malic acid, sodium bicarbonate and cholecalciferol (vit D). It has to be said that BSN are really stretching their marketing claims here by trying to assign a special name to this blend of ingredients, which largely serve a functional purpose in the formulation, rather than significantly affecting any major physiological variables. 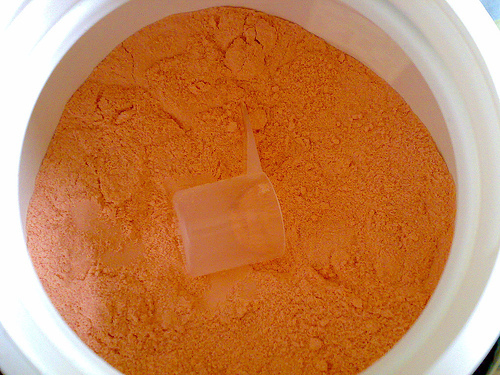 Citric and malic acid are usually included in amino acid formulations to help modify pH while also helping to balance the sourness/bitterness of the amino acids. Sodium bicarbonate on the other hand acts largely as an alkaline balancing agent, but does have ergogenic properties when used in multigram doses. Together the ingredients impart the effervescence of the supplement, but it’s hard to argue they have any ‘EnDurance’ qualities. In terms of ingredient dosing, there are some critical differences between Xtend and Amino X that are important to be aware of. Firstly, all the amino acids in Amino X occur in a single proprietary blend termed “Amino Acid Interfusion”. So there’s no way of knowing the actual amount of individual aminos within the mix. Xtend is a lot better when it comes to transparency of dosing as the levels of each amino acid are disclosed. In terms of total amino acid levels, there’s very little difference; with Amino X providing 10g and Xtend providing 10.5g. When comparing dosing of both supplements, it really comes down to what amino acids each supplement contains and their respective levels. Because Xtend is the only one that discloses doses, its hard to go past it as the better dosed of the two. The respective effectiveness of Xtend and Amino X naturally relates closely to the chosen ingredients and their dosing. With the transparent dosing used by Xtend, it’s hard to pass it up as the supplement with the more credible and effective dosing. There is also more published research to support the addition of glutamine to a mix of BCAAs versus alanine or taurine. However, that's not to say that the combination of BCAAs, taurine, citrulline and alanine won't work well for some. Both Amino X and Xtend come in a decent range of flavours, but Xtend has the more extensive offering with a total of 8 flavours compared to 4 for Amino X. Quality of flavour between the two is pretty similar and hard to separate. If mixing in a glass with a spoon, one generally needs to leave it stand for a minute to dissolve properly. However, when mixing in a shaker, this is not an issue with either; however, Amino X froths more as it’s an effervescent powder. Both mix reasonably well and taste pretty good, but our consensus at MrSupplement is that Amino X is slightly the better of the two when it comes to taste, while Xtend just edges out Amino X when it comes to mixability. Amino X and Xtend are priced very similarly making it hard to separate them purely on a price basis. The smaller version of both supplements provide 30 servings each, while the larger Amino X (1kg) provides 70 serves and Xtend (1.125kg) provides 90 serves. So one could argue that the larger Xtend provides a bit better value. To sum up, Amino X and Xtend are both quality supplements in their own right and likely to provide significant benefits for performance and recovery to the average athlete. The most exciting and unique aspect about Amino X is its vitamin D content, while the major advantage for Xtend is its transparent and well dosed amino acids. This is also the reason we feel obliged to designate it the winner of the two.